Center for Verification and Evaluation (CVE). DISCUSSION: Effective September 30, 2013, the former Center for Veterans Enterprise (CVE) was renamed the Center for Verification and Evaluation (CVE). The new name more accurately reflects the CVE mission. CVE is a program office in the Department of Veterans Affairs (VA) Office of Small and Disadvantaged Business Utilization (OSDBU). 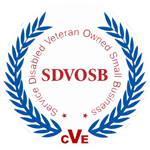 CVE’s primary role is to provide verification to Veteran-Owned Small Businesses (VOSB) and Service-Disabled Veteran-Owned Small Businesses (SDVOSB) seeking to do business with VA. The objective of CVE is to consistently deliver accurate and timely verifications through integrated technology, service and process platforms. The name more accurately identifies to the public the services that CVE provides. CVE evaluates and verifies the ownership and control of SDVOSBs and VOSBs in accordance with 38 CFR Part 74. CVE is the only organization within the Federal government with an independent verification process to validate Veteran status and other eligibility criterion for VOSBs and SDVOSBs prior to participation in the procurement system. VA does this under the authority of the Veterans First Contracting program. Firms approved as eligible for verified VOSB or SDVOSB status are registered in CVE’s Vendor Information Pages (VIP) database, which is used for VA contract set-asides. CVE enables VOSBs to expand their opportunities within the Federal marketplace and enables VA to achieve its small business and socioeconomic procurement goals. CVE’s name change will not affect the verification process and Veteran business owners are encouraged to continue use of CVE’s web-based application process. The average processing time for verification applications is less than 45 days. Firms can test their verification readiness by using verification assistance resources like Verification Self-Assessment Tool, Verification Resource Tool, Verification Assistance Briefs, and Frequently Asked Questions.